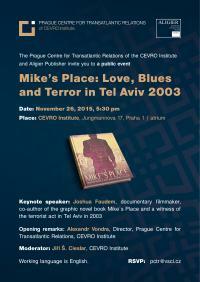 The Prague Centre for Transatlantic Relations of the CEVRO Institute (PCTR) and Aligier Publisher invite you to the public event “Mike´s Place: Love, Blues and Terror in Tel Aviv 2003”. The keynote speaker of the event is Joshua Faudem, who is a documentary filmmaker, the co-author of the comic book Mike´s Place and a witness of the terrorist act in Tel Aviv in 2003. The event takes place on 26th November at 17:30 in the atrium of the CEVRO Institute (Jungmannova 17, Prague 1). The event will be opened by the PCTR Director, the former Minister of Defense and the Czech Foreign Minister Alexandr Vondra. The moderator of this event will be Jiří Š. Cieslar from the CEVRO Institute. During the event, you will have the possibility to enjoy the documentary movie “Blues by The Beach”, on which is the comic book based.. Moreover, the lecture will be concluded with the signing and selling of the new publication “Mike´s Place: A True Story of Love, Blues, and Terror in Tel Aviv“ (CZECH EDITION) and a glass of wine. Working language is English. 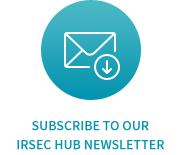 Due to organizational matters we kindly ask you to confirm your participation.